Andrea Johnson/MDN David Leite, president of the Ward County Historical Society, speaks about the future of the Pioneer Village museum in a meeting held at Immanuel Lutheran Church on the museum grounds on Thursday. The Ward County Historical Society has received several offers of donated land where it could potentially relocate its Pioneer Village Museum off the North Dakota State Fairgrounds. Historical society president David Leite said at a historical society meeting held Thursday evening that, provided land is donated, the cost of relocating museum buildings and other work could be reduced to about $1 million instead of the $2 million that the museum had originally estimated. Some contractors have offered significant discounts. 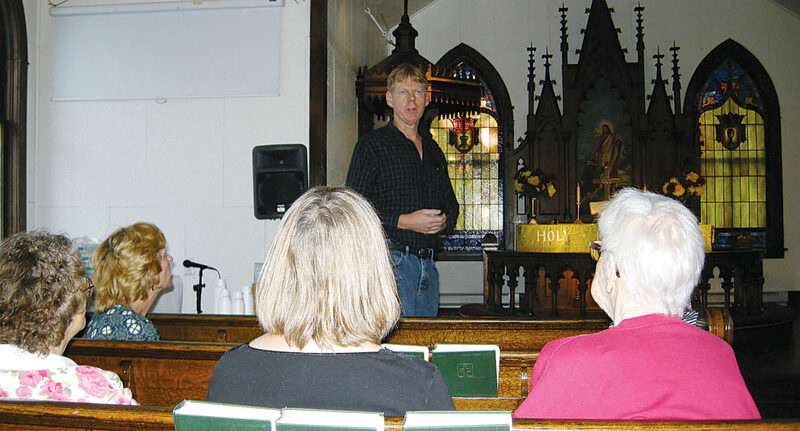 Speaking in the Immanuel Church which historical society members restored with the help of others after the Souris River flood of 2011, Leite said a similar group effort is needed again. “Now, after a six year fight with the Fair (Association), we’re going to have to come together again,” said Leite. Financial donations are particularly needed. Andrea Johnson/MDN Hunter Andes, a director of the Makoti Thresher’s Association, presents a proposal for relocating the Ward County Historical Society’s Pioneer Village Museum to the Makoti threshing grounds. Historical society members will evaluate the land that is offered and see whether it meets their needs. City officials in Burlington are interested in having the museum moved out to that area, the former county seat, and other offers have been made of land in the Minot area. The State Fair Association is scheduled to meet at the North Dakota State Fair Center on Oct. 3 and Leite said he anticipates that he will receive more information about any potential monetary help the Fair Association might offer for a relocation as well as its timeline for the relocation. Some representatives have suggested the Fair Association wants the museum buildings moved off the fairgrounds by June 1, 2019, which Leite said would be unrealistic, or by the State Fair, which will be held in July of 2019. The Ward County Historical Society lost a long-running civil suit this summer and have decided not to appeal to the Supreme Court. The State Fair wants the museum removed from the fairgrounds and Judge Rhonda Ehlis ruled this summer that the State Fair Association owns the land where the museum is situated. The historical society had long resisted moving the museum and said it had a right to leave the museum on the fairgrounds under the terms of a 1966 agreement. 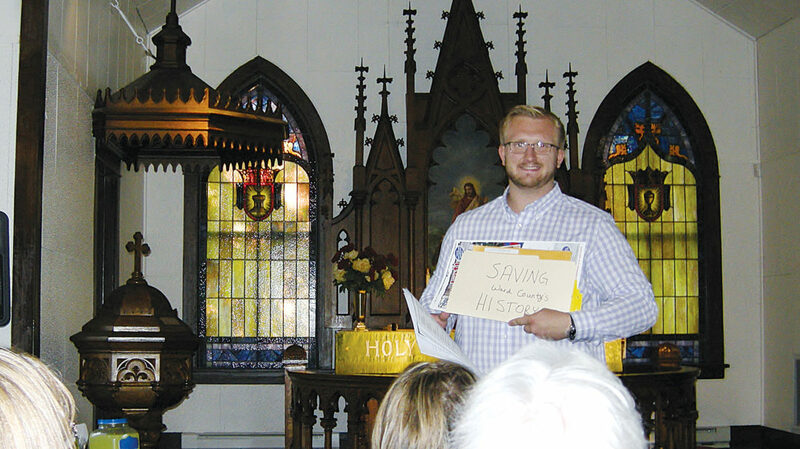 Historical society members said they no longer want to expend energy on a lawsuit and plan to grow the historical society in its new location. Audience members said it will be important to make sure that the historical society owns the land where the museum is eventually relocated so it will not have to be moved again. Dan Caswell of the historical society said the museum might be expanded to include more space for car shows. The historical society has also discussed adding an ice cream parlor at its new location and a new visitor center and bathrooms. Leite told the audience that professors and students from Minot State have offered to put together a business plan for the society when the museum is relocated. Hunter Andes, a director of the Makoti Thresher’s Association, made an enthusiastic proposal Thursday suggesting that the museum be moved to the Makoti Threshing Show grounds. 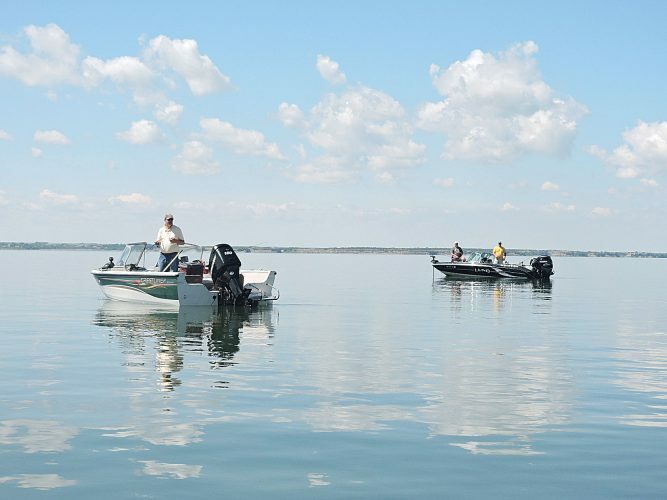 Andes said that the Thresher’s Association board of directors has not yet approved the proposal, but he believes that it would be easily approved. The addition of the pioneer village would add to the attractions at the Makoti Threshing Show, said Andes, who said similar museums are a great draw at threshing shows he has attended in Austin, Man., Rollag, Minn., and in Crosby. He said that moving the museum buildings out to Makoti would also be a great way to attract attention to the museum and to the threshing show. 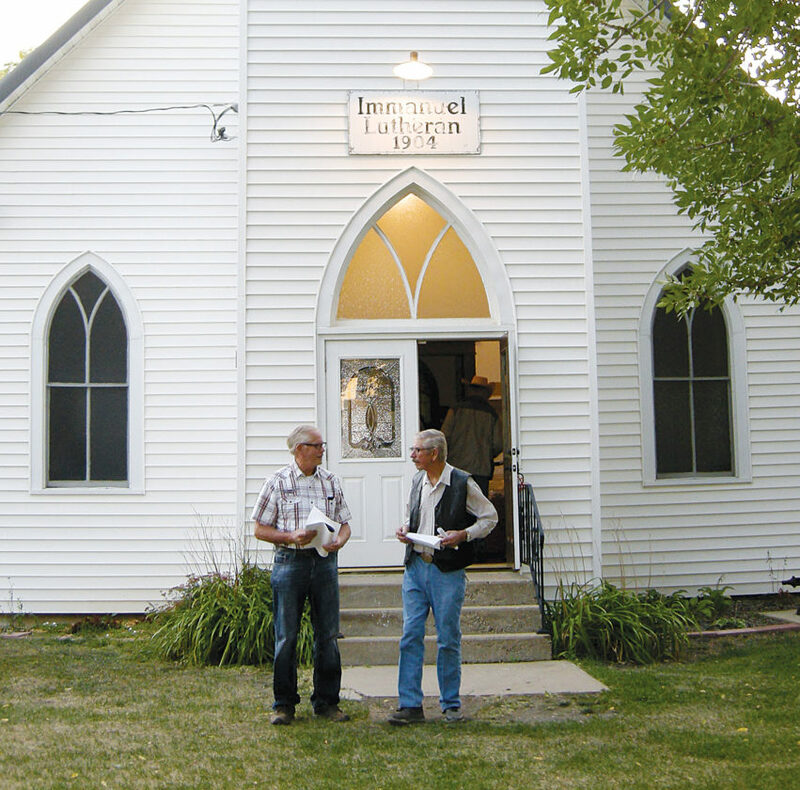 Andrea Johnson/MDN Two historical society members talk outside the Immanuel Lutheran Church after a meeting about the fate of the Pioneer Village Museum held there Thursday. “Once the house mover gets the wheels under the buildings, it really doesn’t matter if they’re going one mile or 50 miles,” he said in a letter to the Ward County Historical Society. “It’s a straight shot to Makoti – the truck would only have to turn twice after leaving Minot. Power lines should not be too much of an issue. There aren’t too many on the route of Highway 83 and Highway 23 to Makoti. Andes, who holds an engineering technology degree from Bismarck State College, said he would be glad to design the layout of the pioneer village on Makoti’s threshing ground. He said there are water hookups within about 100 yards of the site and the city’s sewer system is also nearby. Ward County doesn’t just mean Minot, said Andes, pointing out that that part of the county holds a rich historical heritage. It might also be a draw for people living in southeast Mountrail and northern McLean Counties. Andes also said he would help the historical society write grants for funding. People in the audience at the meeting seemed interested in Andes’ proposal, but also worried that the distance between Minot and Makoti might make it difficult for volunteers to run the site. Andes’ proposal is one of several that the historical society will have to evaluate, along with other offers of land. Donations can also be sent through the Pioneer Village Relocation Campaign at Town and Country Credit Union, 615 South Broadway, Minot, N.D. 58701 or directly to the Ward County Historical Society at P.O. Box 994, Minot, N.D. 58702. The historical society meets on the first Thursday of every month on the museum grounds. Submitted Photo Bug hunting participants are shown during Drift Prairie Day at the Upper Souris Wildlife Refuge, north of Foxholm, in October 2017. Justin Martinez/MDN Senior running back Caleb Bonness looks for an opening in Des Lacs-Burlington’s home game against Lewis & Clark/Our Redeemer’s on Friday. Jill Schramm/MDN A chalkboard for visitors to record their gathering place ideas and signage indicating the history of the buildings, along with colorful artwork, brightened up vacant space in the area of a proposed downtown gathering place Thursday. Justin Martinez/MDN Senior Mason Diehl winds up for a return in Minot High’s match against Grand Forks Central on Friday at Hammond Park. Jill Schramm/MDN Andrea Sammons demonstrates pottery making to visitors taking in Gathering 1.Oh! in downtown Minot Thursday. Alex Eisen/MDN Bishop Ryan senior running back Chinaza Udekwe (25) sizes up Nedrose defender Jersey Await (21) in a Class A Region 3 football game played Friday evening at Herb Parker Stadium. The Lions knocked off the Nedrose Cardinals, 46-14, to remain unbeaten with a 3-0 overall record. Jill Schramm/MDN Jayde Brentrup chooses a paint brush to add to the color on an art table as Sarah Beth Roseth with Jelly Bean Street oversees the project at Gathering 1.Oh! downtown Thursday evening.